How many of them did you do? There were only 3 or 4 official ones? artist: Frankie Goes To Hollywood title: Frankie Say War! Hide Yourself format: T-shirt design: XLZTT photography: n/a cat. 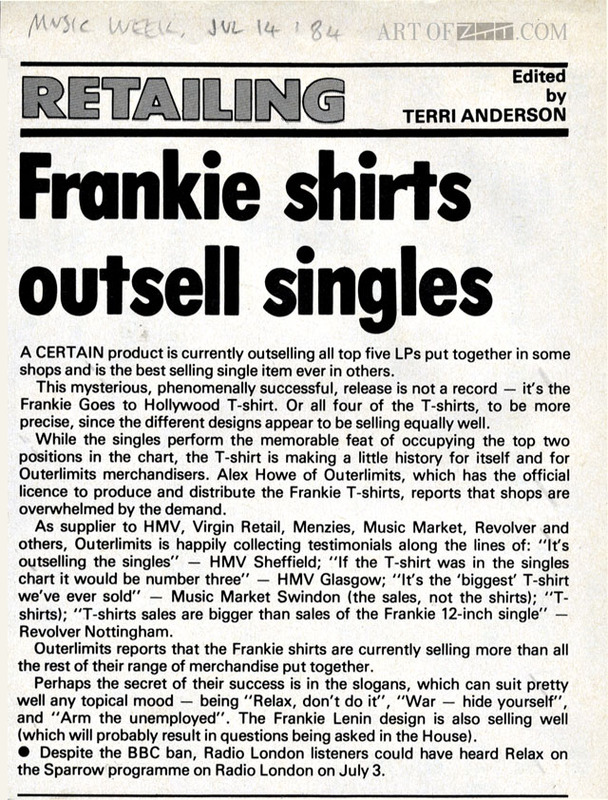 no: n/a date: 06/84 art of notes: Of all the numerous variations on the Frankie Say T-shirts (most of them bootlegs) there were only three designs generally available to the public: ‘Frankie Say Relax Don’t Do It’, ‘Frankie Say War! Hide Yourself’ and ‘Frankie Say Arm The Unemployed’. 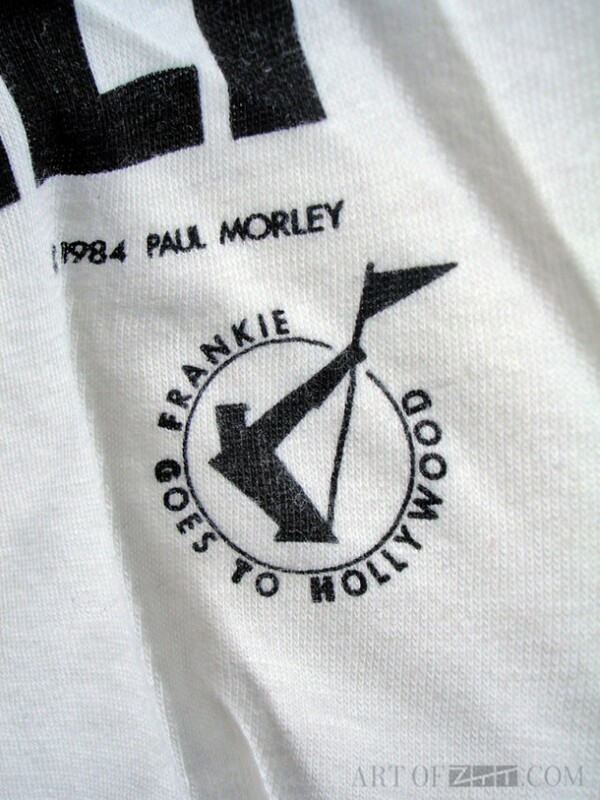 All had black text on a white shirt and most had © Paul Morley above the Frankie logo in the lower right corner if they were official. 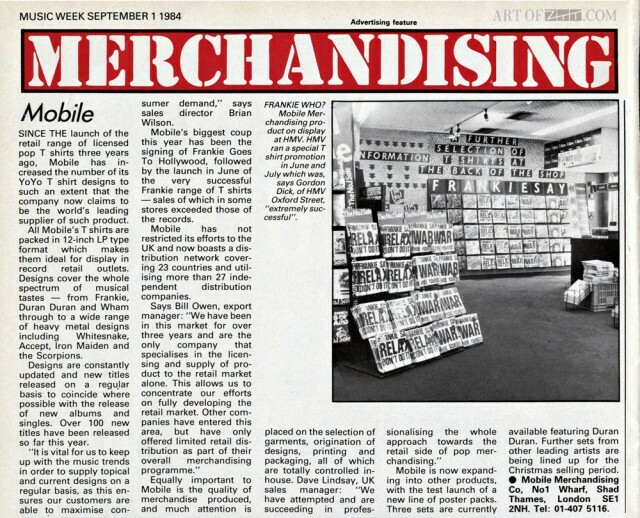 There were several other official shirts available too, a black T featuring the Anton Corbijn image of Lenin from the Two Tribes cover, and two shirts featuring Ronald Reagan – one a photograph and one a cartoon caricature bearing the line, ‘Only Frankie Can Stop Me Now’. These are all believed to be official but possibly originate from the US. The black Lenin one was definitely in the UK, I had that at the time and got it in Scotland where I lived at the time, probably in an Our Price as there wasn’t much else around to buy from. 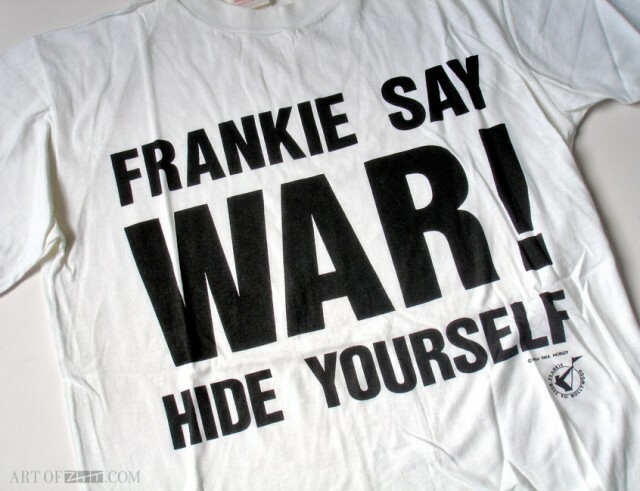 Is it possible to buy the Frankie Say War Hide Yourself t-shirt from this website? Hello. Cool article. There is an issue with your website in internet explorer, and you might want to check th0i3#82&s; The browser is the market leader and a large element of other folks will miss your fantastic writing due to this problem. 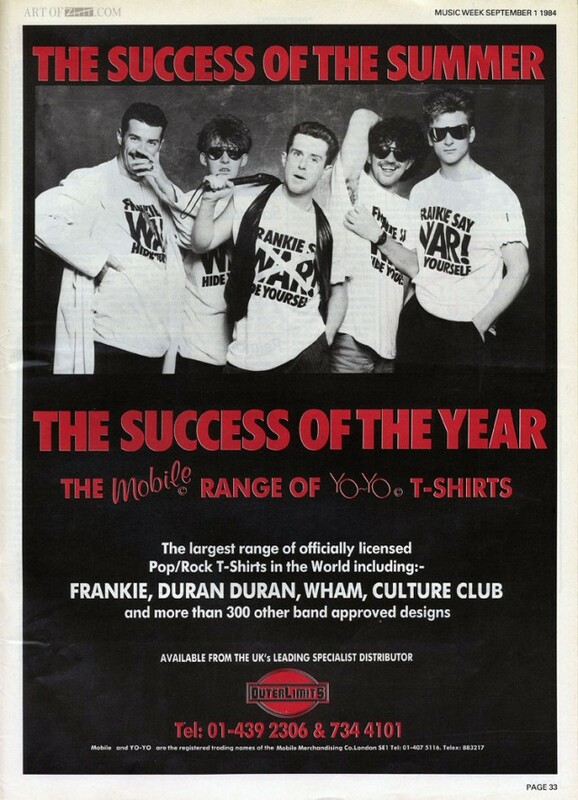 If anyone has an official FRANKIE SAY shirt in size XL or larger, I want it in a BIG, BAD way. Thank you. Been looking for a Only Frankie Can Stop Me Now shirt. Had one in 1984, but don’t know what happened to it. The bullet hole in the head was great. Too bad Hinckley was a piss poor shot. Not saying I wanted anyone dead, but..
Had another Frankie shirt. Forget what it was.